Last week's Tuesday Ten featured pictures from our beach vacation. Well, I am fortunate to live in a place that allows us to be at the beach OR the mountains in just a couple hours. I grew up in a town that is in the foothills of the Blue Ridge Mountains. My parents still live there and, every summer, I take the girls and go stay with them for a few days. (We are there right now!) I thought it would be fun to do a similar post this week featuring pictures from our mini-vacation! MeMaw helping Emily pan for gems. The quintessential grandpa (or Pa as referred to by the grandkids), he will do just about anything for his granddaughters, including piggy back rides around the lake trail! One of our favorite activities to do when we visit my parents is to go to Cone Lake and walk the path around it. It is beautiful and parts of it are covered by lilly pads that have beautiful blossoms like the one in the picture. Water falls always make me think of the mountains. These are two that are around the lake. Due to the incredible amount of rain we have had so far this summer, both waterfalls were flowing extremely quickly. I love mountain laurel. There weren't many blooms on it this time, but I found a few! Wildlife is abundant in the mountains. These are all animals we saw while walking around the lake. This picture was actually taken in June, but it is such a great one I had to include it. My brother lives about 15 minutes from my parents, so we always make a point to get our families together when we are up for a visit. He has three children, too, who are all close in age to mine. Every time we get together, they seem to automatically pair off and pick up right where they left off. 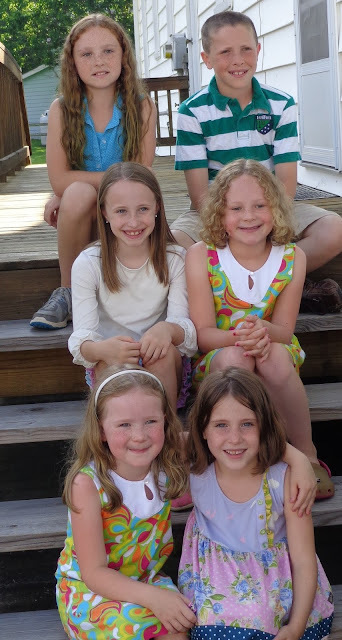 Cousins sometimes make the best of friends! No trip to the mountains would be complete without a stop in Blowing Rock. 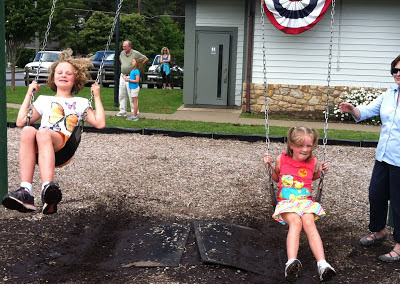 Here, Megan and Emily are swinging at the park. And - no trip to Blowing Rock would be complete without at stop at Kilwins for some ice cream and chocolate!! Sorry this one is a bit blurry. 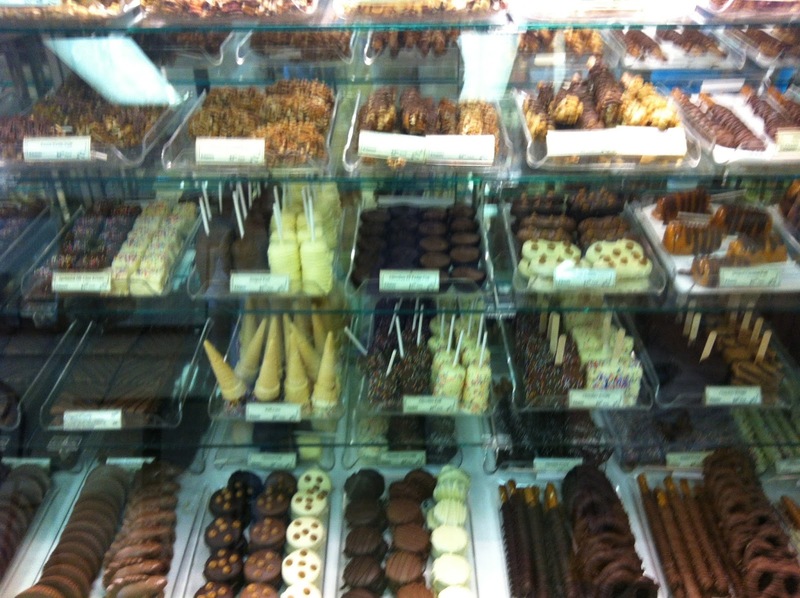 I only had my camera phone and I was a little intoxicated by all that chocolate loveliness!!! 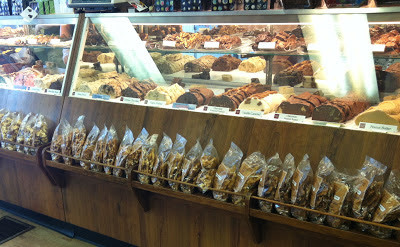 Fudge, fudge, and more fudge! 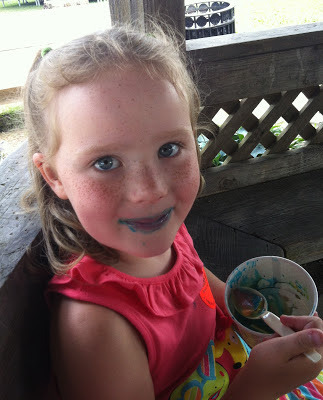 Blue mouth from her Kilwins favorite - Superman flavor! This picture pretty much sums it up don't you think??? Family, fun, nature, and sweets! All reasons going to the mountains makes us smile! Great pics, and although the scenery makes me homesick for New England, the best part of vacation is, without a doubt, watching the kids with their extended family. Absolutely! I love seeing my girls interact with my parents and with their cousins! Thank you , Ashley! Blowing Rock is one of my favorite places. I took it for granted when I was growing up because I lived so close. Now, when I go back, I remember how special it is!